Spoon & Knife - Christine & Mike, photographer & cook, creating gluten-free, low-carb, keto and paleo food - together! Spoon & Knife - Christine & Mike, photographer & cook, creating gluten-free, low-carb, keto and paleo food - together! This is my knife. There are … actually, there are none like it, and this one is mine. My knife is my best friend. It is my life. I must master it as I must master my life. This is my level-up. I’ve known for years that I wanted a kitchen knife made for me. Like a tattoo, this is a permanent thing – I needed to be certain about exactly what I wanted. This isn’t about developing better knife skills or about a style of cooking. It’s about zeroing in on my behaviors and moves when cooking. Being aware of what characteristics best suited my own style. Reaching this level means, in a way, I can articulate my own workflow and habits. That’s a lot of self-awareness to channel through a knife. This is a post that has been years in the making. Start with the punchline. This is a custom 6″ petty (utility) knife made from 52100 carbon steel. The handle is amboyna burl with box elder bolsters, nickel silver pins and a mosaic pin at the back for decoration. Not shown well in this photo is a blue liner material on either side of the blade tang for a pop of color. Handcrafted leather sheath dyed coffee brown with snap closure. Created for me by Russell Montgomery of Serenity Knives. A petty knife is the Japanese knife style similar in use to a western utility knife. It’s larger than a paring knife, smaller than a chef’s knife or gyuto. This isn’t a typical form of any of those knives, but it falls in the category. This size of knife is the workhorse in my kitchen at home. Amboyna is the burl wood from the Pterocarpus species. See The Wood Database for the burl and Wikipedia for the species. Box elder is a type of maple tree; see The Wood Database and Wikipedia for more. How does it perform? Well, it’s a knife. It cuts things. But seriously, it feels great in the hand and cuts quite well. This is a great all-arounder for my needs. I’ve been following Russell’s work since he made the steak knives for Oxheart at it’s opening a little over four years ago. We had moved into our house in the Heights the summer before (mid-2011), and I had gifted myself a super-thin Japanese gyuto for surviving the process. Discovering a bladesmith making great knives within walking distance of my house? That became a grail knife for me. Russell and I met later that year, when I asked if he could help straighten a blade for me. I didn’t expect anything was possible, but I figured it couldn’t hurt to ask. Plus, it was a way to meet the guy. Bless him, he did his best, but there was no correcting that one. I did learn that you’ve never met somebody so completely happy to be working at making knives. You can’t avoid smiling when talking shop with Russell. It’s infectious. At that point, I set the idea of my own custom knife aside to germinate. I stalked Serenity Knives on social media. I promised myself that once I knew exactly what I wanted, I’d order my grail knife. What pushed me over the edge? I knew I was ready when I realized I had been completely wrong about what I wanted. Self-awareness, level up! A 10″ Thiers-Issard Sabatier in stainless steel. Sentimentally French. Does everything well. A 10″ Mexeur et Cie Sabatier in carbon steel. When you REALLY want to get old school, go carbon steel. Rusts if you aren’t (mildly) careful, develops a well-worn patina with use, can impart a metallic taste to acidic foods (though it’s never happened for me), and sharpens razor sharp. A 240mm Konosuke HD gyuto. There’s a reason this subset of knives is referred to as a “laser”. It’s a very thin knife, made from a steel that takes an extremely keen edge and cuts almost effortlessly. It’s not stout enough to do heavy work, but it’s light and fast. (That’s just the 10″ chef’s knives, by the way.) The point is, all those knives are well-loved, well-used, and have a lot of life left in them. Each of them purchased deliberately to try something new or fill a gap. Collectively, they hit on everything. I didn’t have a need to fill with a new knife. The second realization is that the most used knife in the kitchen – the one I reach for every time I cook dinner – isn’t one of these. It’s a knife I almost didn’t get in the first place. It’s a 210mm damascus petty knife that Christine picked out when we visited Epicurean Edge in Kirkland, WA. 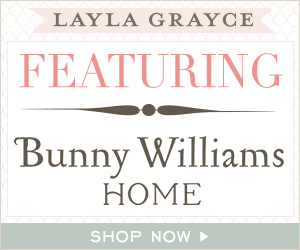 (If you haven’t been, and you’re in the area, and you’ve read this far – GO. Daniel and the crew there are awesome.) I was looking for one knife that they helped me find as I explained what I was trying to do (general use, break down chickens, etc). Of the six or so knives we talked through, I had picked mine, and dismissed another as too thin. Christine picked up the dismissed knife and commented on how it felt right in her hand. She could see herself using it, and suggested we get it as well. So, we did. And it’s the knife I use every day. Those realizations cemented it for me. Generally, what I wanted was a utility knife. Something to use everyday. Not too large – I’ve got the “bigs” covered – and not too small (don’t need another paring knife) – and it’ll see use every day. Earlier this year I packed up my most-used kitchen knives in my knife roll and headed over to meet with Russell. (Same infectious glee.) While I knew what I wanted, I also wanted to walk him through it – have somebody with a strong perspective and more experience check my math, as it were. And that’s when he flipped over a sheet of paper, took out a pencil, and began drawing. Tracing lines from parts of three or four knives. Erasing and connecting dots as I commented. Picked it up and looked down the lines as if he was looking down the actual knife. Asking me more questions as he went along. A wide, beefier handle because I have big paws for hands, and while the main grip on a knife comes in the pinch between thumb and forefinger, handles that are too small are simply uncomfortable. And then the aesthetics. A wooden handle, contrasting for effect, decorative because, frankly, I’m only doing this once. A more rustic finish left on the flat part of the handle, initials on the pile side of the blade, et cetera. I chose every detail. This is it. This is MY knife. And you know what? I couldn’t be happier with it. Seriously. This knife is everything I asked for and more. A knife maker can produce a good knife. A craftsman can produce a high quality well-appointed knife. A distinguished craftsman can take an idea from a crazy obsessive like me, interpret it through his own skill, and bring that idea to life in a quality that is unmistakably his yet custom for me. Russell is definitely distinguished that way. Inclement weather and feeling a bit under-the-weather has kept me indoors and in a simple food mood. I know when I’m starting to go downhill as we tend to eat out more, or graze on cold food in the fridge. Sometimes a little push to get back in the groove is what I need to get back on track – and it’s good to get “back to basics” with one pan meals. In this case, I’m starting with quick cooking shrimp in mind, then changing it up to adapt to things I have in the fridge – think of it as a French-influenced stir-fried shrimp, without using the words “fusion cuisine” anywhere. The key to this is building the dish in layers. Wash, clean, and slice leeks thinly. Cut up some celery too, if you happen to have it (I love the stuff). 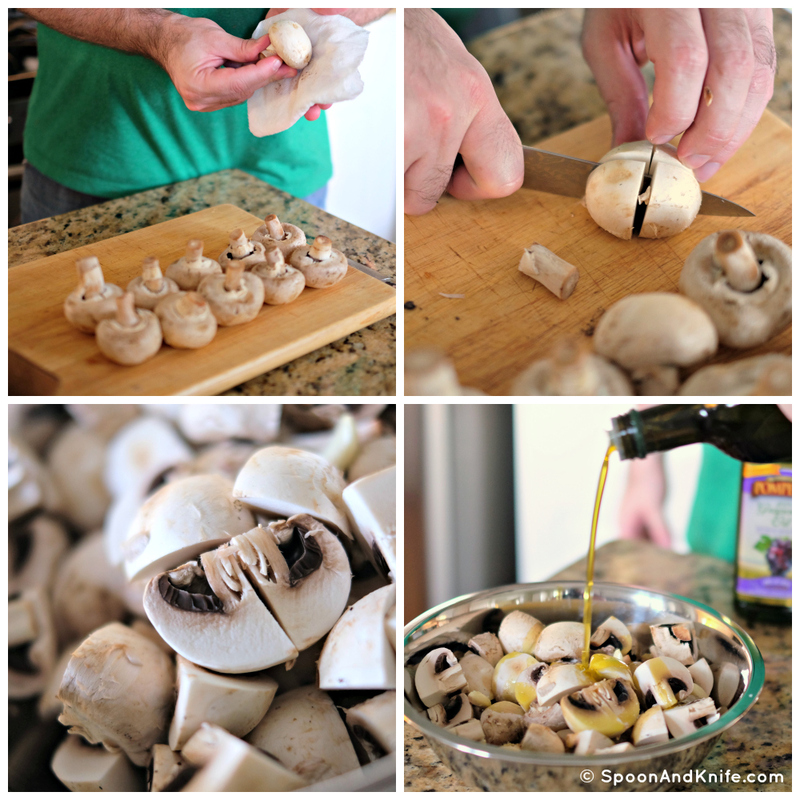 Heat up a pan with some high-temperature oil like grapeseed or safflower oil and a bit of butter for flavor. Leeks go in first to soften up and develop a bit of color. Then the celery just until it starts to soften, next a handful of walnut pieces, and when the nuts are toasted, in goes a pound of shrimp. Keep tossing or stirring the food in the pan – this is one of those times where you get to keep poking and mixing around the food so it cooks evenly. 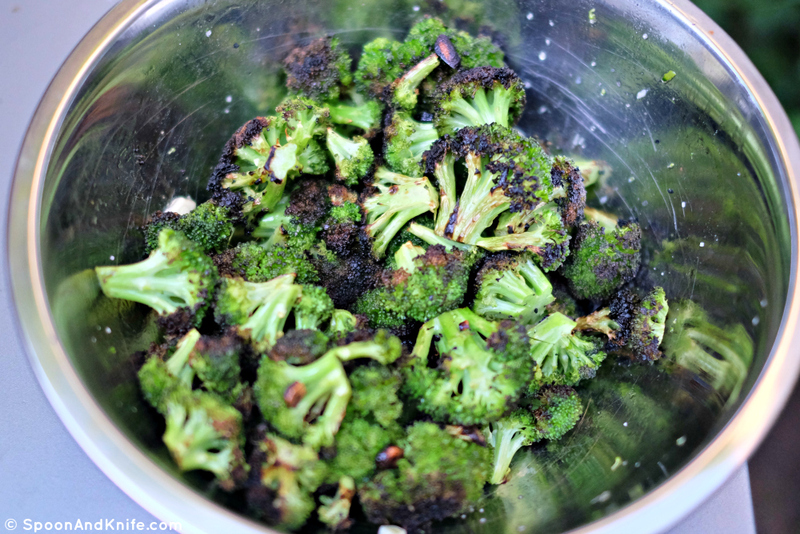 Finally, add a bit of soy sauce or Worcestershire sauce to brighten it up, serve in a bowl, and finish with a drizzle of walnut oil over the top. That’s all there is to it. One pan, a bit of cooking things in sequence rather than all at once, and dinner’s ready in about fifteen minutes. This is completely adaptable, too – once you decide on the central ingredient (Shrimp? Pork? Beef? Mushrooms?) it becomes an exercise in pulling together complementary flavors. For instance – swap shallots for the leek, sesame oil for the walnut oil, peanuts for the walnuts, and add a handful of basil and this becomes Thai-inspired. Play with it and make it your own. And, however your day goes, I hope cooking a quick meal helps get your groove back. Grilled steak. As iconic Americana goes, that’s right about at the top with Norman Rockwell’s Thanksgiving feast. And like so many shared cultural foods, if you ask ten people the best way to grill a steak, you’ll get twelve surefire answers. 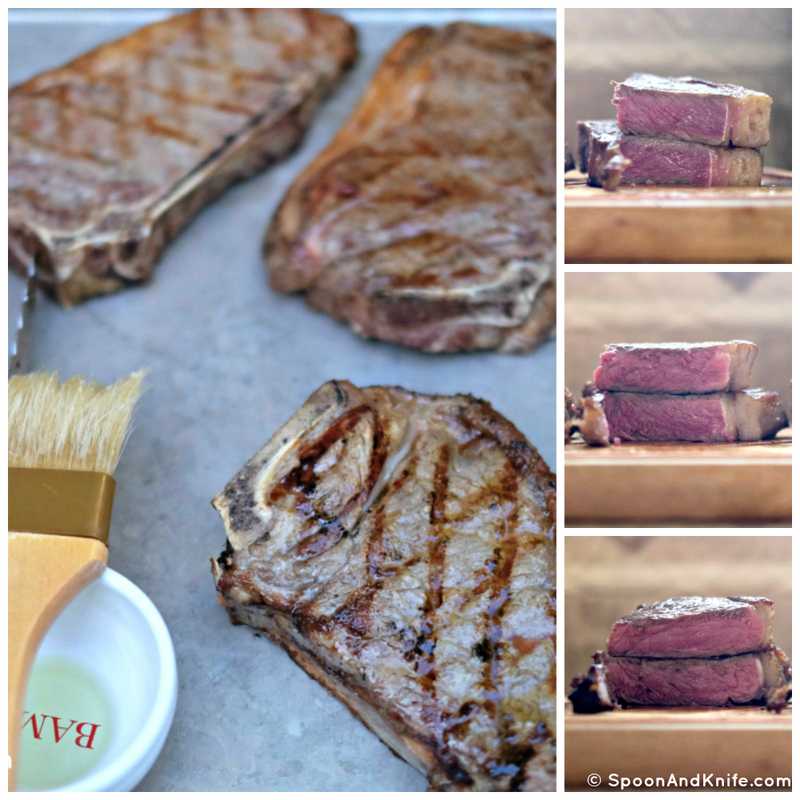 I wanted to set up a little side-by-side shootout for myself, to decide a) what works best for me, and b) whether I could finally grill a steak without overcooking it. 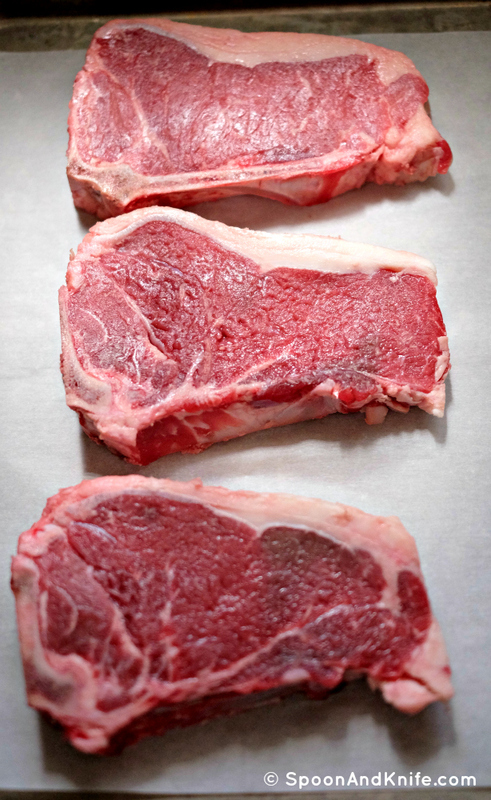 The contenders are bone-in strip steaks each clocking in right around 16 ounces. I don’t mess around with steak. • Grilling lid closed, single flip. • Grilling lid open, single flip. • Grilling lid open, constant flip. While getting to know the grill again, I’ve found that foods cook more evenly with the lid closed. This makes me a bit twitchy as a cook. I firmly believe that when you put heat to food, for the most part you leave it alone – I don’t stand there and poke and prod food in the pan. However, I do have use of all my senses – sight, smell, sound, touch, and when appropriate taste – to know how food is cooking. Is it cooking faster than usual? Unevenly? Ready to toss, turn, or flip? Cooking times are at best approximate – if I tell you to grill a steak for two minutes, I don’t mean precisely-to-the-second, because there are so many variables to consider. Oiled and salted for the grill. Cooking with the lid down is like the scene in Star Wars when Luke Skywalker practices lightsaber use against a floating drone with the helmet’s blast shield down. It’s blindfolded cooking. You can kind of hear the food cooking, and you can generally smell it, but you can’t see it without opening up the grill, and doing that drops the surrounding temperature. Still, it’s hard to argue with results, and in all the recipe testing I’ve done, I’m getting better results with the lid closed. All the instruction books say to do that (that I’ve seen, not just from STOK), and why argue with a manufacturer? For the grill open test, I had two techniques to consider. One school of thought is to only touch the steak once (three times if you twist it for diamond grill marks), and otherwise? Leave. It. Alone. I generally follow this kind of rule on the cooktop. The other technique is a constant flip. By flipping every 20-30 seconds, you’re in effect pulsing the direct heat hitting the steak, the argument being that the steak will cook more evenly (less of a band of grey overcooked steak around the center). I haven’t tried this before, although I certainly get the arguments. Just before putting on a hot grill, season the steak with salt and brush a thin film of oil on. Grill steak. On a hot grill, this is roughly 3:30 per side for medium rare, but that really depends on many factors – use an instant read thermometer to be certain. Clockwise from top left/top: open/single flip, open/continuous flip, closed/single flip. The results? Better grill marks are observed on the closed lid steak. The constant flip did cook more evenly to the edges, and seared more evenly – no time to develop grill marks. The open lid single flip had the largest gray band of overdone meat around the outside. And flavor? All three were fantastic, although Christine and I tended to prefer the closed-lid steak (and I’ll work on my timing to keep from overcooking). Of course, it never hurts to finish the grilled steak with a little lemon brown butter, alongside some grilled broccoli… but those are another post. 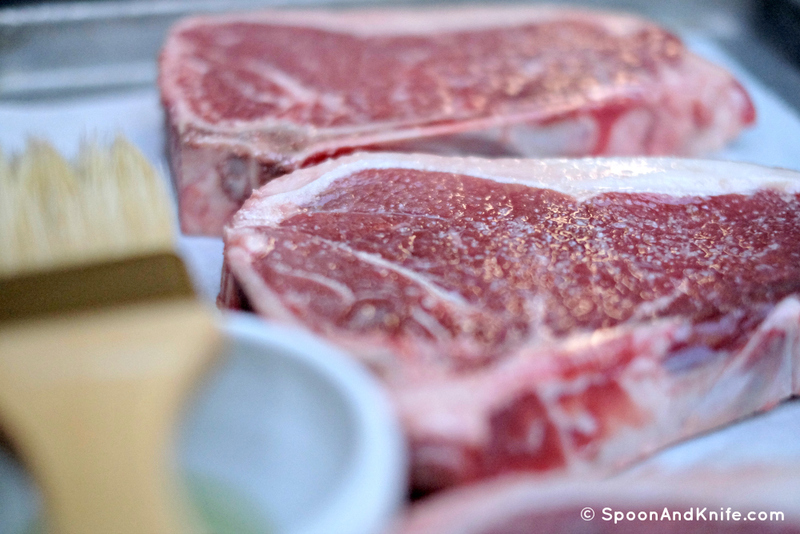 Dry the outside of the steak and preheat the grill. Place steak on grill and close cover. Cook for 2 minutes. Rotate steak 45 degrees (diamond hash marks) and cook for 1 minute 30 seconds more. Let steak rest at least 10 minutes before cutting and eating. NOTE: Cooking times are very approximate. Judge for yourself or, better, use an instant read thermometer. It’s slightly cliché, but burgers seem as good a place as any to start with a grill. Straightforward, unfussy, simple is often better. 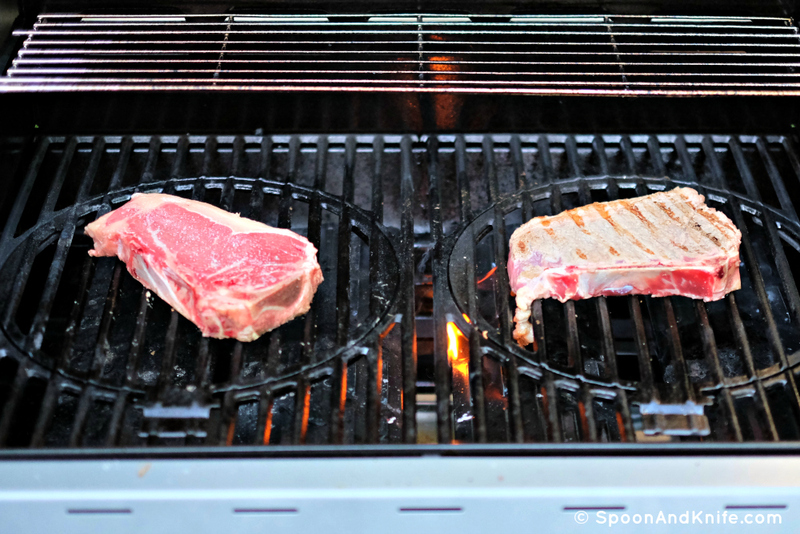 Plus, it gave me a chance to do some side-by-side comparison of using the grill vs. the griddle for a better sear. Grind the meat with a coarse die in the grinder. 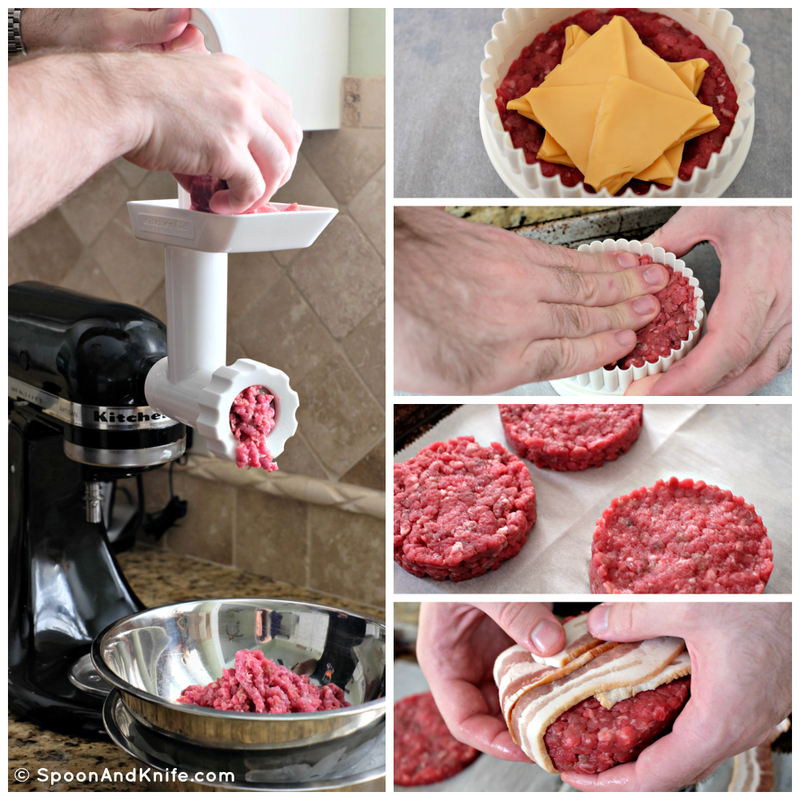 Form into patties using a biscuit cutter or other form. Let the patties rest on a tray in the refrigerator at least 30 minutes. Heat the grill on high for 5-10 minutes. Brush grates with oil. Salt and brush/drizzle a thin film of oil on the top of the patties. Place on the grill oil side down and salt the other side. 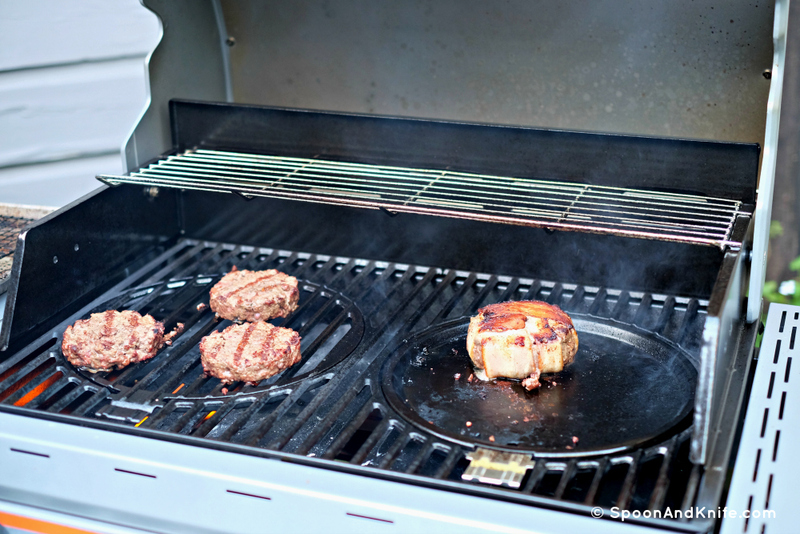 Close the grill cover and check the burger after two minutes; the goal is to see juices start to seep or pool on the top of the patty. Flip the patty and cook until desired doneness (an instant read thermometer is your friend here). That’s it – straightforward and fast. One thing to note; compared to cooking these on a pan or griddle on the stovetop, these cooked a bit more evenly and didn’t have as much juices pooled on top for the flip. Keeping the grill cover closed creates something of an oven effect – it’s far from a sealed container, but it definitely holds heat in and affects cooking. The burgers cooked more evenly and with better grill marks when closed, so I still prefer that method. I also cooked a burger on the griddle; on a stove, a flat hot metal surface helps with even all-over sear. I didn’t get so much the same effect on the grill griddle insert, something I want to try out a few more times. 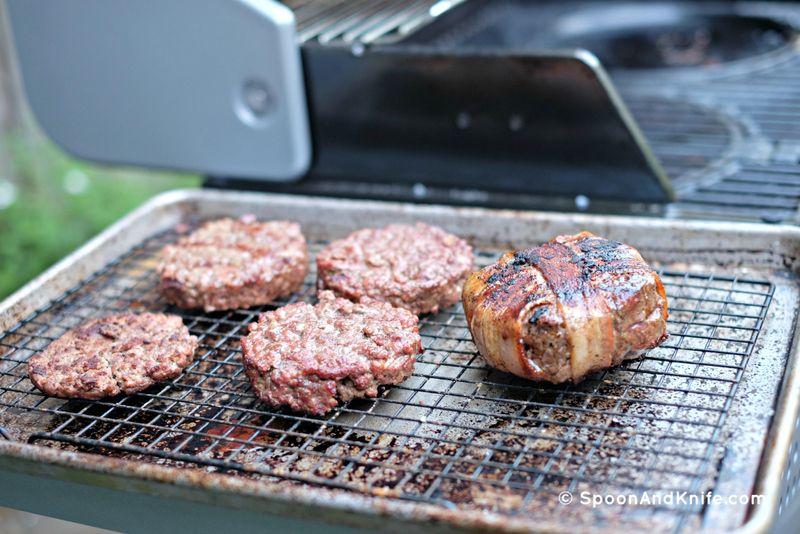 Cooking burgers over the grill grates has the advantage of a larger surface (more meat!). However, the griddle was perfect for the elevated form of a burger: the bacon-wrapped juicy lucy. When forming the bottom patty, press down in the center to create a small indentation or well. Fold the corners of the cheese in to the center, and place the cheese on the bottom patty, leaving a margin of beef around to help seal. Place or form the second patty on top of the first, remove the mold, and double-check that a good seal has formed – nothing quite as deflating as a cheese blowout on the grill. After resting, wrap the patty in the bacon strips. There’s not a precise science to this, but I try to cover as evenly as possible (i.e. don’t have all the ends meet in the center) and keep all the ends on the same side of the burger (so, a “seam side” and a “flat side”). Preheat the griddle side of the grill over medium heat. Place the burger bacon-seam-side down to start, and cook until juices are seen on the top or the bacon browns well on the seam side. Flip and continue cooking until done. This burger needs to cook more gently than the simple recipe – this is a larger burger, with cheese at the core, which needs to cook and melt before the bacon exterior burns. On the Quattro, that meant a hot side grill for the simple burgers and a medium side griddle for the juicy lucy – both can cook at the same time. You know, this whole grilling thing? I could get the hang of it. When forming the bottom patty, press down in the center to create a small indentation or well. Fold the corners of the cheese in to the center, and place the cheese on the bottom patty, leaving a margin of beef around to help seal. 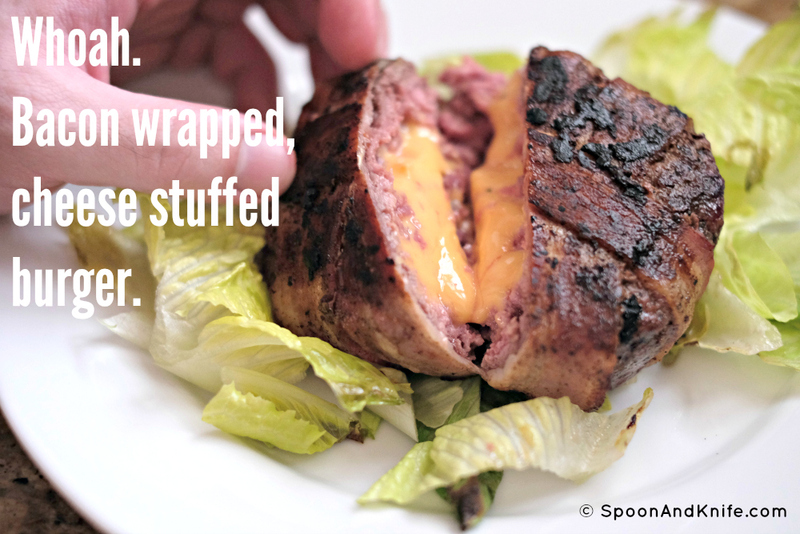 Place or form the second patty on top of the first, remove the mold, and double-check that a good seal has formed - nothing quite as deflating as a cheese blowout on the grill. After resting, wrap the patty in the bacon strips. There's not a precise science to this, but I try to cover as evenly as possible (i.e. don't have all the ends meet in the center) and keep all the ends on the same side of the burger (so, a "seam side" and a "flat side").